I've been using Dragon Naturally Speaking for many years. For those who don't know it's a voice to text program. Just recently probably the last 2-3 months I've noticed a problem with it in Opera. When DNS13 is not active or running Opera is fine. 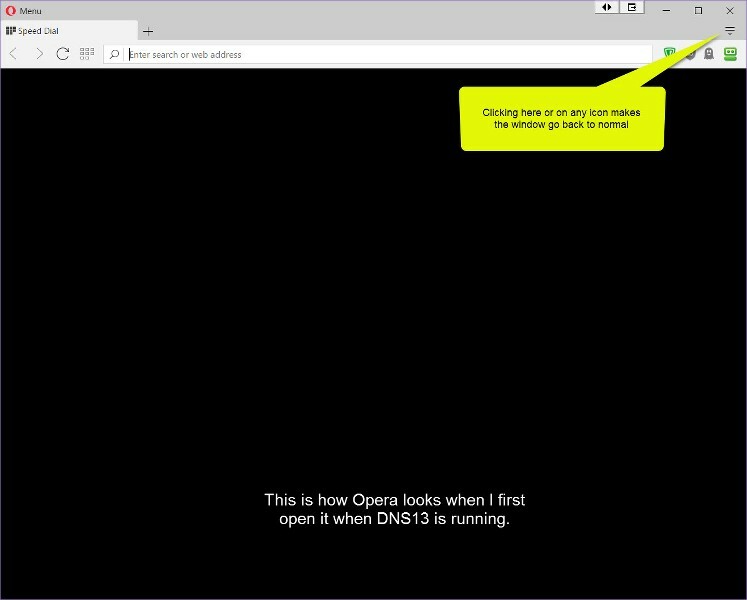 But as soon I launch DNS13 the Opera GUI becomes black.I can make it return to normal by clicking on one of my extension icons at the top right of Opera.This problem only occurs when I open Opera for the first time.Subsequent tabs or new windows are not affected. It's probably a somewhat obscure problem but I thought I would post it here because it is annoying. I'm using Opera 39 with Windows 10 x64 home edition. Here's a screenshot of how it looks whnn dragon Naturally Speaking is running. As anyone found a solution to this?? Maybe you could try disabling hardware acceleration. I have the same issue. Does somebody have a solution ? Me too. Maybe someone will come up with the answer and let the rest of us know. Has anyone written them? If I can find where to write< I will do so. Have you tried to contact the authors of 'Dragon Naturally Speaking' so they can try to fix the issue? I have the same problem. Anyone got a fix to this? This isnt a dragon problem, its an Opera problem. Dragon works fine but Opera wont start for me and just has a single black screen with no content.